The Jesuitenkirche lies at the very heart of the old University District ("Universitätsviertel"), which is understandable since the Jesuits were closely affiliated with the university for centuries. Even today, more than hundred years after the university has been moved to the Ringstraße, the Jesuits are still involved with its religious life the the Jesuitenkirche is often called the "University Church". Before I start writing about the individual buildings that you can find here, let′s get an overview: There is the church itself, the "Alte Aula" or congregation hall of the University, which is now used as the headquarter by the Austrian Academy of Sciences. It faces the old Jesuit monastery. The square between is called "Dr Ignaz Seipl Platz" and named after a chancellor of Austria from the inter-war period, who was a clergy man himself and is now considered quite a bit of a reactionary. The hole area surrounding this square is dominated by small lanes and alleys from late medieval and Baroque days; a particularly charming part of Vienna, I recommend you to stroll around and sneak into one or two of the small bars and cafes that you can find here. One of the latter sort is the Café Alt Wien, which is easily as filthy and Bohemian as the famous Hawelka, but a lot less touristy. Following the Schönlaterngasse Lane, you will get to the Heiligenkreuzerhof Court, the "Vienna branch" of the once powerful and still quite rich abbey Stift Heiligenkreuz. With the abbots of big monasteries holding the ranks of princes at times, it was important to them to have an appropriate residence nearby the emperor. Further down towards the Fleischmarkt Road ("meat market"), you can find two interesting churches: The "Griechische Kirche" ("Greek Church") in red-brick, designed by Theophil Hansen (the one of the Stock Exchange, the Houses of Parliament or the Academy of Fine Arts). This Greek Orthodox church serves the local Greek community - "St Barbara", the Ukrainian Catholic church, is around the corner - alongside with the local Ukrainian community. Back to the Jesuitenkirche: As I described in the article on the Universtiy of Vienna, the uni was founded in 1365. The old Latin name is "Alma Mater Rudolphina Vindobonensis", referring to its founder, Duke Rudolf IV and his brothers Albrecht III and Leopold III. Most of the early staff came from the Sorbonne in Paris in 1383. 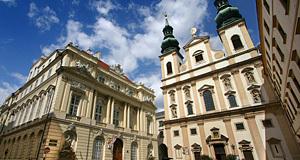 Only 70 years later, 6,000 students populated Vienna mostly in the Jesuitenkirche area and made the university one of the biggest academic institutions in Europe. As Vienna turned into a rather miserable place in the course of Turkish wars and the reformation, the university was in serious trouble in the 16th century with student numbers dropping below 30. In 1623, the university was finally merged with a new college run by a fairly new order, the "Societa Jesu" or Jesuits. Continue with "Jesuitenkirche & Old University - Part II"